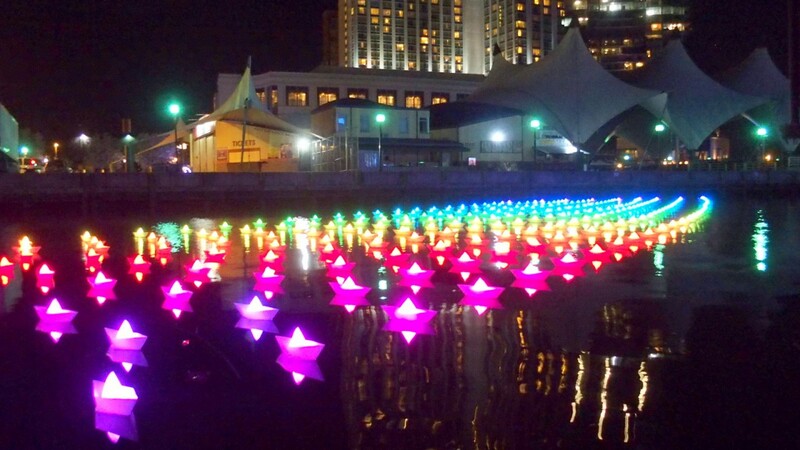 Quick report on our visit last night to Baltimore’s new festival, Light City, at the Inner Harbor. • That peacock was hot! Baltimore might want to think about retiring the one-color flamingo as its kitsch mascot in place of this multi-colored, 20-foot-tall. 1,200 pound illuminated one. Maybe it was the bird’s snappy signature song. Located on Pier 5, it’s a kid magnet. 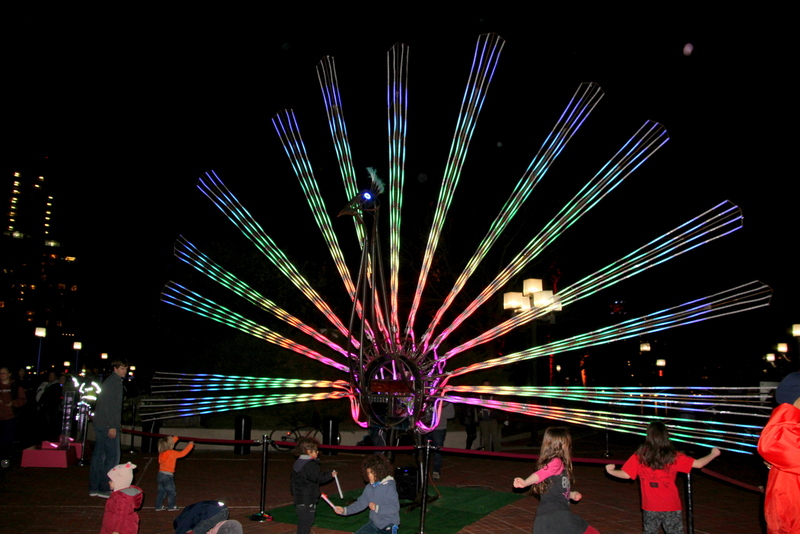 Adults and children were dancing right up next to it as the tail opened and closed and the music played. • Dancing in Bmore on a Tuesday night? People were liking the bouncy funk and rock at the Concert Stage at Harbor East provided by Speakers of the House. At Club Light City near the Visitor’s Center, DJ Face had the large crowd pumped up and dancing. • Too Subtle? The complex, edgy meaning the artists intend for “Diamonds Light Baltimore” is fascinating when you read about it (here or here) but without that explanation, these just look like big walk-in diamonds. • Drive-by Demographics: Largely white crowd down near Harbor East, including dressed-up people who looked like they just came from a fancy dinner or event. More diverse crowd at the other end, toward the Maryland Science Center. There were some kids and toddlers in strollers on both ends of the festival route. • Out of Context – The “In Light of History” installations – about Baltimore’s involvement in the slave trade – was maybe too successful. It didn’t have any information sheets in the boxes. Presumably there was material that explained each spot’s significance. By 10 p.m., the sheets were all gone. A promising sign, but keep the boxes stocked, organizers! • No Fried Dough: And that’s a good thing. Unlike other city festivals that come to seem dominated by food stalls and tchotzkes, this one was pretty much all about the lights, art, performance and music. • Haunting: The images at Pipelines, Luminous Intervention’s installation at McKeldin Fountain, are a short walk off the horseshoe-shaped festival route snaking around the Harbor. That’s apt, since it’s about the people in Baltimore who are a world away from the city’s tourist waterfront. The faces of Tyrone West, Freddie Gray and others who died in encounters with police will stay with you.